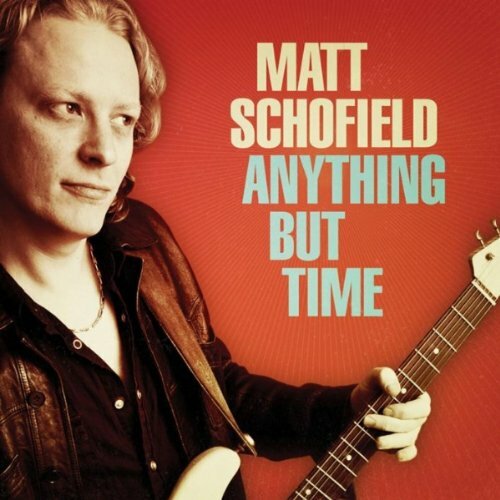 I was introduced to Matt Schofield via his 2007 Ear To The Ground CD and quickly fell in love with the title track. I listened to that record a lot and was convinced this was a talented kid on the way up, someone I should keep an eye on. I intended to just that but somehow lost track of him for a while. I'd listen to Ear again and intend to check out what he was up to but never held the thought long enough to do anything about it. One of the advantages to doing the weekly New Music Tuesday column at Blinded By Sound is fewer releases get past me without my knowledge. I hadn't heard any of his music for a few years but I preordered my copy of Anything But Time and haven't stopped listening since it arrived last month. Famed blues producer John Porter (BB King, Buddy Guy, Santana, Otis Rush's Ain't Enough Coming In) helmed the Anything But Time sessions in New Orleans with Schofield and his band. The Schofield Trio is an interesting configuration in that there is no bass player. Organist Jonny Henderson provides the bass line on keys with his left hand while providing organ accents with his right. Drummer Kevin Hayes signed on with Schofield in 2010 after years playing with Hall of Famer Robert Cray. There are sonic and stylistic limitations for a blues-rock trio even in this digital age, but this 10-song effort feels substantial. The band varies tempo and song length and the quality of the material and performance makes this sound like a cohesive album rather than a repetitive, mundane one. The shuffling title track and extended, slow blues of "See Me Through" get the album off to an exciting start. Schofield is comfortable playing an updated brand of traditional blues and excels in the more contemporary modes. The lead playing throughout is fantastic. He may not be a visionary but his phrasing is tasteful and expressive. Guitar and blues students will surely spot influences but he is no knockoff. His solos have purpose and focus, avoiding the pointless noodling favored by too many contemporary guitar hot shots. Comparisons to Ear To The Ground may not be useful as many of you won't have heard it but it is clear Schofield has developws and grown a lot over the past four years. There may not be anything as immediately catchy on Anything But Time as the title track from its predecessor, but this a much deeper record. The jazzier explorations of Ground are absent and are missed but the streamlined style yields a record with greater continuity. He and his trio are skilled enough for blues-jazz interplay but Anything But Time reveals Schofield's greatest strengths come through his blues muse. This is a record worthy of the talents of its creator and I've quite fallen in love with it. I won't lose track of Schofield again. For those of you who've yet to discover him, Anything But Time is a brilliant place to start.